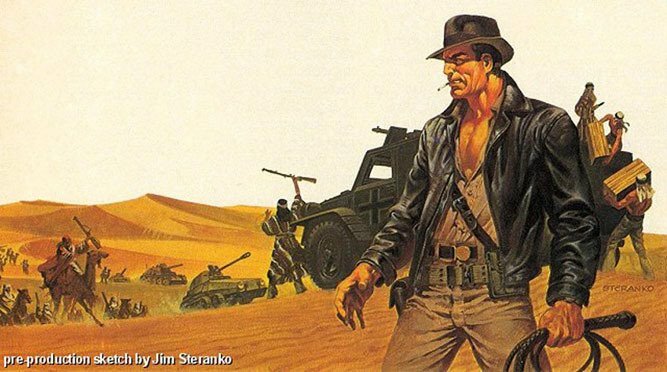 We’ve heard a lot of “what ifs” about Raiders of the Lost Ark (full review). Originally Tom Selleck was going to be Indy, but took “Magnum, P.I.” instead. The iconic fight scene where Indy shoots the sword-wielding guy in the market only happened because Harrison Ford had a bad case of the shits. Hell, I once heard John Amos say that he was in the running for the part, which would have been awesome in many ways. But now the Grail of what-ifs has been released- Someone has leaked a transcript of the 9 hour story sessions between George Lucas, Steven Spielberg, and Lawrence Kasdan. Say what you want about them, but these men are master storytellers who’ve given us some of the most memorable movies of the last few decades, whether it be Star Wars or Jaws or Body Heat. Kasdan wrote the script for The Empire Strikes Back as well. 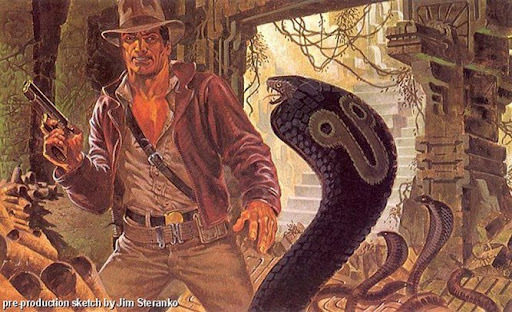 The leaked transcript is 125 pages long, and begins with some basic ideas about creating a modern pulp hero from the ’30s mold, when he was just an idea- Indiana Smith- and you can see how they shape the character, the story, and the legend. For lovers of the movies, or aspiring screenwriters, this is a goldmine of enjoyment. I got the concept art from John Leighton‘s blog. S — You know what it could be. I have a great idea. He hears the sand… When he goes into the cave, it’s not straight. The whole thing is on an incline on the way in. He hears this, grabs the thing, comes to a corridor. There is a sixty-five foot boulder that’s form-fitted to only roll down the corridor coming right at him.’ And it’s a race. He gets to outrun the boulder. It then comes to rest and blocks the entance of the cave. Nobody will ever come in again. This boulder is the size of a house. Of course, it’s a scan of typed pages- welcome to the days when word processors wore skirts- but it’s a great read. The transcript is available for download here. …and if you don’t own them, get ’em without Crystal Skull (full review) while you still can! Nice find! And there’s a transcript for my e-reader, awesome.